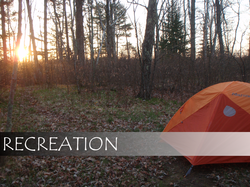 Whether you are paddling some of Wisconsin's 13,000+ miles of navigable waterways, hiking along the geologically historic Ice Age trail, snowshoeing to a backcountry cabin, or just enjoying the sites and sounds of Mother Nature; Pedal, Paddle, Pack has a recreational experience for you to enjoy. Checkout the Calendar of Events for upcoming trips. Ever wished you could predict the weather? When was the last time you made an entire meal of things you picked out of the forest? Have you wanted to try backcountry camping, but not sure where to start, what gear to buy, or worried what muscles might be sore afterwards? Join us for an educational evening around the campfire, where we will answer these questions and many more. Checkout the Calendar of Events for upcoming education. Whether its helping the local Ice Age Trail chapters in trail maintenance and construction, organizing a group paddle down a local river or biking the Mountain Bay trail to pick up garbage; Pedal, Paddle, Pack would like to invite you to join us in the conservation of our great trail and waterway system right here in Central Wisconsin. Checkout the Calendar of Events for upcoming efforts.